Mamma Mia! It’s the Official Opening Night! Mamma Mia! is terrific fun. Perhaps the single most ecstatic musical to open on Broadway since A Chorus Line. Mamma Mia! leaves you uplifted, enraptured and feeling like a number one! Mamma Mia! is a mega-hit that has audiences dancing in the aisles. This feel-good musical is a phenomenon! 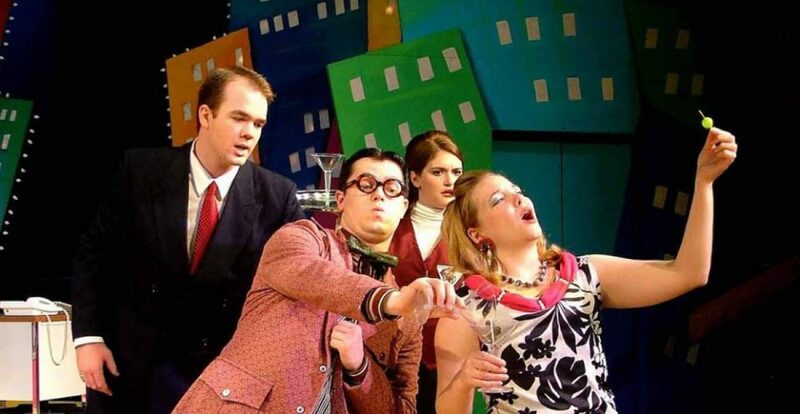 Audiences seeking escapist fun are returning night after night to relive the thrill! The most fun on Broadway! Audiences are going wild! For a third consecutive year, Jessie Inman, CEO Confederation Centre of the Arts, has been named one the region’s top corporate managers. At a gala dinner in Moncton last week, Atlantic Business Magazine announced Inman as one of the ‘Top 50 Atlantic Canadian CEOs’ and will feature her in the May/June issue. Inman was one of only two Island business leaders named this year, the other being John Griffin, president and general manager of W.P. Griffin Inc. who was also named CEO Innovator of the Year by Atlantic Business. W.P. Griffin Inc. is a recognized leader in producing, packaging and marketing P.E.I. potatoes locally and internationally. Wayne Hambly, Chairman of the Board of Confederation Centre – or the Fathers of Confederation Buildings Trust – acknowledged the notable achievements of both Ms. Inman and Mr. Griffin. Inman became CEO of Canada’s national living memorial to the Fathers of Confederation in November 2011. Originally from St. Catherine’s, P.E.I., she has worked all over the world but was thrilled to have been able to return to her roots and contribute to her province and country. She now lives in Charlottetown with her husband Allan. Noel Peirce Coward, whose play “Blithe Spirit” is at the Watermark Theatre all summer, was born on December 16, 1899, receiving his first name because Christmas was just days away. From an early age, Noel was intelligent, temperamental, and an instinctive performer, making his first stage appearances in amateur concerts at age seven. He loved to sing and dance at any excuse and threw frightful tantrums if he was not summoned to perform for guests. With his mother’s encouragement, he launched his professional acting career at the age of 12, making his London debut as Prince Mussel in a children’s show called The Goldfish. He appeared in several West End productions, including the “lost boy” Slightly in two West End editions of Peter Pan. In the early 1900s, England was a very class-conscious society. A boy actor born to poor parents would have been snubbed by the upper classes. However, Coward’s extraordinary determination and charm won him an entree into the chicest circles. His professional and social ambitions were insatiable. I Leave It To You (1920) was Coward’s first full length play produced in the West End, with Noel playing a leading role – quite an accomplishment for a lad of 21. The brief run brought encouraging reviews, whetting Coward’s appetite for more. The London production of his play The Young Idea (1923) was a mild success, with Noel playing one of the lead roles. That same year, producer Andre Charlot featured several of Coward’s songs in the hit revue London Calling. While all this was happening, Noel put the finishing touches on a daring drama that would change his career – and his life – forever. He wrote, directed and starred in The Vortex (1924), a searing look at sexual vanity and drug abuse among the upper classes. When most producers refused to consider such a lurid project, the small Everyman Theatre in suburban London agreed to take it on. On opening night, the audience was both shocked and fascinated by The Vortex. The combination of fiery acting and scandalous subject matter made The Vortex the talk of London. Other plays had depicted drug abuse, but not among the rich. Demand was such that the production soon moved to a larger West End theatre for an extended run, making Coward a sensation. With the sudden success of The Vortex, Coward was in demand. Over the two years he starred in the London and New York productions, as well as an American tour. Coward also wrote the hilarious comedy Hay Fever (1925), which triumphed in London, and the hit West End revue On With The Dance (1925). He also turned out Fallen Angels (1925), Easy Virtue (1925), The Queen Was in the Parlour (1926) and The Rat Trap (1926). Most of these plays were at least partially successful, but he was working at a punishing pace. Coward prospered through the worst of the Great Depression, enjoying a lifestyle most people could only dream about. A dedicated traveler, he went on a series of extended journeys to escape the pressures of show business. During one 1929 stay in Singapore, he finished the first draft of Private Lives (1930), which proved to be a highlight of his career. Coward co-starred with a then unknown Laurence Olivier, playing to packed houses in both London and New York. Coward then wrote and directed Cavalcade (1931). Acclaimed on the London stage, the film version won the Academy Award for Best Picture in 1933. In 1942, he turned out a trio of hit plays, including the semi-autobiographical comedy Present Laughter (1942) and the cockney drama This Happy Breed (1942). His biggest wartime hit was Blithe Spirit (1942). The play proved one of Coward’s most popular successes, with character actress Margaret Rutherford winning stardom as the eccentric medium Madame Arcati. She repeated her role in a superb film version three years later. The years following the war were difficult for Coward. Other than the London revue Sigh No More (1945), most of his new works met with commercial failure. Coward knew instinctively that his writing was better than ever, but it seemed that the public’s tastes had changed. A 1963 revival of Private Lives took London by storm, sparking renewed interest in Coward’s plays on both sides of the Atlantic. Revivals and TV productions of his works followed and continue to this day. In January of 1973, Noel visited New York for a gala performance of the off-Broadway revue Oh Coward! He arrived with longtime friend Marlene Dietrich on his arm. Bent with age and illness, he remained the personification of elegance. Friends sensed that he was declining, but no one realized that his would be his last public appearance. In the early morning hours of Monday, March 26, 1973, Noel Coward suffered a stroke at his home in Jamaica. Tennessee Williams wrote “The Glass Menagerie” – on this summer at the Watermark Theatre! Thomas Lanier “Tennessee” Williams III was an American playwright and author of many stage classics. Along with Eugene O’Neill and Arthur Miller he is considered among the three foremost playwrights in 20th-century American drama. Tennessee was born on March 26, 1911, in Columbus, Mississippi, the second of Cornelius and Edwina Williams’ three children. Williams described his childhood in Mississippi as pleasant and happy. But life changed for him when his family moved to St. Louis, Missouri. The carefree nature of his boyhood was stripped in his new urban home, and as a result Williams turned inward and started to write. His parent’s marriage certainly didn’t help. Often strained, the Williams home could be a tense place to live. “It was just a wrong marriage,” Williams later wrote. The family situation, however, did offer fuel for the playwright’s art. His mother became the model for the foolish but strong Amanda Wingfield in The Glass Menagerie, while his father represented the aggressive, driving Big Daddy in Cat on a Hot Tin Roof. When he was 28, Williams moved to New Orleans, where he changed his name (he landed on Tennessee because his father hailed from there) and revamped his lifestyle, soaking up the city life that would inspire his work, most notably the later play, A Streetcar Named Desire. In 1940 Williams’ play, Battle of Angels, debuted in Boston. It quickly flopped, but the hardworking Williams revised it and brought it back as Orpheus Descending, which later was made into the movie, The Fugitive Kind, starring Marlon Brando and Anna Magnani. Other work followed, including a gig writing scripts for MGM. But Williams’ mind was never far from the stage. On March 31, 1945, a play he’d been working for some years, The Glass Menagerie, opened on Broadway. Critics and audiences alike lauded the play, about a declassed Southern family living in a tenement, forever changing Williams’ life and fortunes. Two years later, A Streetcar Named Desire opened, surpassing his previous success and cementing his status as one of the country’s best playwrights. The play also earned Williams a Drama Critics’ Award and his first Pulitzer Prize. His subsequent work brought more praise. The hits from this period included Camino Real, Cat on a Hot Tin Roof and Sweet Bird of Youth. The 1960s were a difficult time for Williams. His work received poor reviews and increasingly the playwright turned to alcohol and drugs as coping mechanisms. In 1969 his brother hospitalized him. Upon his release, Williams got right back to work. He churned out several new plays as well as Memoirs in 1975, which told the story of his life and his afflictions. But he never fully escaped his demons. Surrounded by bottles of wine and pills, Williams died in a New York City hotel room on February 25, 1983. Festival Completes Casting of Mamma Mia! It’s an early start to the season for the cast and crew of The Charlottetown Festival. Rehearsals kicked off last week for the P.E.I. theatre event of the year — Mamma Mia!, opening June 1 in the Homburg Theatre. McGrath), and British banker Harry Bright (Cam MacDuffee). Local audiences are acquainted with all three, with Guy-McGrath appearing as the fiddle-playing René in last fall’s Evangeline and Cournoyer playing the villainous Hampson in that show as well as the White King in Alice Through the Looking-Glass. MacDuffee starred in Ring of Fire and Dear Johnny Deere, and toured with Cournoyer for the Centre’s 2015 production, The Founding Father. Sophie’s husband-to-be, the loyal and handsome Sky, played by David Cotton (Baptiste in the world premiere of Evangeline), while Donna’s two best friends are brought to life by Jan Alexandra Smith and Nicola Dawn Brook. For the full Mamma Mia! cast list, see addendum. For a limited time only, the Festival is offering 20% off performances in the month of June. Use promo code ABBA when contacting the box office online, in person, or via phone. This offer runs from May 21 to 28, applies to Tier-1 and 2 seating only, and is not valid with any other promotion. “I have seen a lot of theatre in my short 41 years,” says Artistic Director, Adam Brazier. “Never have I seen a party and celebration the likes of Mamma Mia! This show redefined the modern musical and set in motion the success of other jukebox hits like Jersey Boys, We Will Rock You, and Ring of Fire. This pop fable leaves the audience laughing and dancing in the aisles. Somewhere in the crowd there’s you. Join us on a nostalgic journey through the guiltiest pleasure of the summer.” Brazier is joined by Bob Foster, musical director, and Kerry Gage, choreographer. Mamma Mia! opens June 1 and plays until September 3. Luisa Marshall is “Simply The Best” and her Canada-wide PTSD Awareness Tour HOPE BEYOND THUNDERDOME TOUR 2016 comes to the Harbourfront Theatre on Thursday, May 26th at 7:30 pm. Years ago, Luisa performed for the United Nations Peacekeeping Force in a grueling show tour that included war-torn Bosnia, Sarajevo and later the Multinational Force and Observers (MFO) in Israel and Egypt. The most requested song on both tours was ‘We Don’t Need Another Hero’. Marshall wanted to add meaning to her tour so she chose her passion concerning the PTSD concerns with the Canadian Military and Firemen. Luisa Marshall has appeared on Oprah twice and recently made a special appearance on the Ellen DeGeneres Show to a 25-second standing ovation. Join us for an evening of Tina Turner classics and help bring awareness for Military and Firemen living with PTSD.